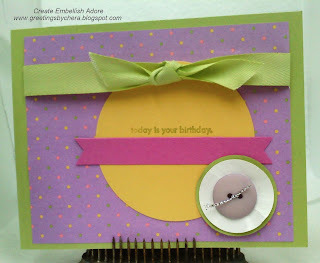 Create Embellish Adore: Its your birthday! So make a wish and here's to all of them coming true! And a milk carton with goodies to help your day get even better! So the Shades of Spring DSP is used on both these items. 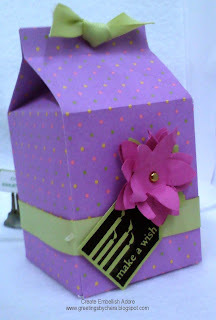 I used a tutorial from Splitcoaststampers for the Milk carton (you can get two from 8 1/2 x 11 CS). The "Today is your birthday" comes from FYI stamp set. I used the coordinating CS colors - Certainly Celery, So Saffron, & Pixie Pink on both projects. TO ALL OTHER FELLOW PISCEANS!!! !